Some considered him a cheat, some said he sold his team and some had blatant dislike and hatred for him but no one can deny the fact that he was a true entertainer and India’s most successful captain till Saurav Ganguly over took him. Growing up in the late 1980’s and early 1990’s he was one of my cricketing heroes. Tall, lean and soft-spoken, Mohammad Azharuddin burst on to the international scene at the age of 21 when he hit three consecutive centuries in his first three Tests against England in 1984-85. “Azzu bhai”, as he was fondly called by his fans enthralled the cricketing world for about a decade and half with his graceful and sublime stroke play. His leg side play with those silken wrists were stuff of the gods. He was not a great off-side player when he started his career, but improved his off-side shot-making dramatically during the later part of his career. He became an exponent of the cut shot and the cover-drive. He had the ability to send a ball pitched one feet outside the off-stump racing to the boundary with his nonchalant flick of the wrists. This prompted John Woodcock, a noted cricket writer, to take a dig at the Englishmen when he said, “It’s no use asking an Englishman to bat like Mohammad Azharuddin. For, it would be like expecting a greyhound to win the London Derby!”. A supremely fit athlete, Azhar was an outstanding fielder and his slip catching was impeccable. After starting his career on such a high note Azhar had a lean patch till the Sri Lankan tour of India in 1986. He registered his highest Test score of 199 against Sri Lanka at Kanpur and was unlucky never to get a double hundred in Tests during his illustrious career. Pakistan toured India during early 1987 and Azhar tormented them with two back-to-back centuries in Kolkata and Jaipur. Despite handling Imran Khan and Wasim Akram reasonably well he still was suspect against short-pitched bowling and had a torrid time during the tour of West Indies in 1989 scoring just one fifty in four Tests. His career was at the cross-roads when India under the captaincy of Krish Srikkanth toured Pakistan in 1989. On the verge of being dropped for the Faisalabad Test, Azhar got in to the playing eleven after an injury to Raman Lamba and came back to form in truly spectacular style by scoring a superb 109 against the fiery Pakistani attack of Imran, Akram and Waqar Younis. That innings instilled a lot of confidence in him and there was no looking back. He scored successive half-centuries in the Lahore and Sialkot Tests and played a big part in India drawing the four match series 0-0. An unnatural leader among men, Azhar was appointed as the Indian captain during 1990 for the tour of New Zealand after the fallout between BCCI and the incumbent captain Krish Srikkanth. Captaincy never seemed to deter him and he had an outstanding tour of New Zealand scoring a masterful 192 at Auckland. During the Indian tour of England in 1990 he scored hundreds in Lord’s and Old Trafford. His 121 at Lord’s was a masterpiece and his 179 at Manchester was even more better, but as a captain he failed to rally his troops and India’s reputation as poor tourists continued. He had lost successive Test series against New Zealand and England away. If that was not enough India endured a difficult tour of Australia during the Australian summer of 1991-92 when they were routed by the Aussies in the five Test series 4-0. As a batsman Azhar’s technique against short-pitch bowling was yetagain exposed and he had a horrid tour, although he managed to score a scintillating hundred at the Adelaide Oval which almost took India to an improbable victory. During this time India had been soundly beaten by Australia in the World Series cup and had endured an abysmal world cup campaign. There were whispers amongst a section of the Indian media and the Indian board calling for Azhar’s head. The calls grew louder after the historical Indian tour of South Africa in 1992 where Azhar was a massive failure, both as a captain and a batsman. However Azhar had the backing of the then Indian coach Ajit Wadekar and he was retained captain for the England series at home in 1992-93. Azhar marked that appointment with a magnificent 182 against England at his favorite hunting ground, The Eden Gardens, Kolkata. Azhar had a special love-affair with Kolkata scoring five hundreds in his seven Test appearances and averaged a whooping 107.5 at that venue. Riding on outstanding performances from the young Indian brigade of Sachin Tendulkar, Vinod Kambli and Anil Kumble India tasted some much needed success under Azhar when they brown washed England 3-0 to win the series. Zimbabwe and Sri Lanka followed England and they where brushed away, Azhar was enjoying captaincy for the first time since he took over the Indian side. More success was to follow against New Zealand and West Indies at home, against this back drop India were one of the firm favorites to win the 1996 world cup. Though Azhar as a batsman did not have a successful world cup India reached the semi-finals where they were ambushed by Sri Lanka at the Eden Gardens. Once again Azhar’s captaincy was under the scanner, but nevertheless he was retained as India’s skipper for the England tour that followed. Indian Team.With Tendulkar donning the mantle and a big weight taken out of Azhar’s shoulders he played with a care free and cavalier approach and was back to his best once again. South Africa and Lance Klusener were to suffer from his hands. Azhar played two of the most audacious innings seen in Test cricket against the South Africans at Kolkata and Cape Town when he shredded the proteas’s attack to pieces to score 109 and 115 respectively. He helped India win the series against them at home but could not do the same in South Africa. In the following tour of the West Indies his form had once again taken a dip and his commitment to the team was also questioned. 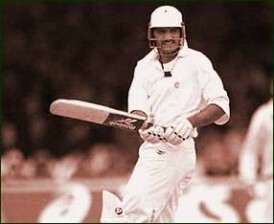 For the first time in his career Azhar was dropped from the Indian side after the tour of the West Indies in 1996-97. Azhar was not part of the Indian squad for the Independence cup in 1997, it was indeed an irony that the then India’s most successful captain was not part of India’s golden jubilee independence celebrations. However his hiatus was not for long as he was recalled to the Indian side for the Sri Lankan tour in 1997 and he promptly reeled of two centuries in the two match series. The pressure of captaincy was weighing heavily on the tender shoulders of Tendulkar and India were beaten soundly on every tour away from home. In search of an experienced hand , Azhar was handed the captaincy for the second time and sure enough he celebrated it in grand style by leading India to a 2-1 victory over the Aussies to retain the Border-Gavaskar trophy. Azhar played a huge part in that series with a useful 64 in the first Test at Chennai and a mammoth unbeaten 163 at Kolkata in the second Test. Azhar lead India in the historic Test series against Pakistan after a gap of 10 years in 1999, under his captaincy India squared the series although they lost to Pakistan in the Asian Test championship. After an ordinary 1999 World Cup campaign Azhar was once again sacked as captain of the Indian team and was in fact dropped for another year before he would make a comeback in the ODI’s in early 2000.In all these times Azhar had played a mountain of ODI’s and had scored heavily in those games as well. In fact Azhar held the record for the fastest hundred by an Indian for almost 21 years before Virendar Sehwag eclipsed that feet. After the disastrous Indian tour of Australia in 1999-00 which did not include Azhar, He made yet another comeback and scored a trademark century against South Africa in what would be his 99th and last Test match at Bangalore in 2000. The man who started his Test career with a hundred had ended it the same way albeit under different circumstances. The match fixing scandal had rocked the cricket world after the revelations by the South African captain Hansie Cronje. During Cronje’s testimony he said that Azhar was the one to introduce him to the bookies. Although Azhar denied all links with the bookies he did admit to fixing three matches between 1996 and 1999 and was slapped with a life ban by the BCCI in 2000. Azhar appealed against his ban and BCCI eventually lifted the ban in 2006. As captain of the Indian cricket team Azhar won 14 Tests and 103 ODI matches. In all fairness we can say Azhar finished just shy of greatness just like the way his Test career which ended with 99 Tests. After his tumultuous cricket career for 15 years, Azhar Joined the Congress party in February of 2009 and got elected to the Lok Sabha from Moradabad constituency in the state of Uttar Pradesh in May 2009. He acknowledged his election victory by saying “I have played my 100th Test ” and thanked the people of Moradabad for keeping faith in him. For a quiet, humble, modest and an unassuming man from Hyderabad who had seen it all Azhar’s life had indeed come a full circle. He never existed as far as I’m concerned, magical wrists or not. Wouldn’t blame you. It took me a while for me to get over what he did. AWTA. A true low life that ****. Azhar was indeed a classy batsman…. dat 100 at Lords in 1990 will forever be etched in my memory !! So many different emotions about Azhar, his batting and his career! cheating TO win a game is one thing… Cheating ppl who love adore and unconditionally support you expecting absolutely nothin in return is the worst low life there can be.. He is in the rite place now… In politics… I just hope his crimes catch up with him and he lands in jail like his pals. I wonder whose hero is? Not Indian cricket fans for sure. A majority of them are disgusted at his becoming a member of politicians and a smaller number thinking he has been punished for his misdeeds and deserves as much of a chance as any one else. Fair enough to have that opinion even if one may have a different point of virew. But hero \” today \” no way. Class bastman. Much like Zaheer Abbas, but more wristy. A natural talent never needed coaching. I have never seen such wristy shots. I feel that being of mild nature was not able to defend himself against temptation. Most cricketers fix matches. I don\’t think that teams mates and management don\’t know about and are themselves involved. Look at any government organisation , if you are honest, your co-workers will mock you until you become like them. Since you are new you will get caught and those same co-workers will turn against you. I think this is what happened with Azhar. Azhar was the best . They are lots of unanswered questions on the fixing controversy , Some say they wanted him out and the scandal was used as a pretense . Ponting , Mark Waugh and Warne agreed to fixing lots of matches and their board let them off with a fine and warning . BCCI was harshest on Azhar . Check Tehelka tapes on fixing in youtube for a better perspective.